The fully grown chair (left), and Krubsack sitting in it as it grew (right). I know this has absolutely nothing to do with tomatoes but this is fascinating…and it has to do with gardening and the natural world right? Enjoy! What Happened to the First Chair Grown From Living Trees? On the hunt for a pioneering piece of furniture. SOMETIMES IF YOU’RE LUCKY, YOU stumble across corner of the world that immediately captures your imagination. Last summer, when I got into the world of tree shaping—the practice of coaxing trees into sculptures and structures, useful and otherwise—I wanted to know everything I could about it. Eventually, I visited and wrote about a small company in England, Full Grown, that is working to grow an entire forest of chairs, tables, and other furniture. But a small mystery remained, one that I couldn’t let go of: What happened to the original “Chair That Grew,” the first chair coaxed from growing trees? The first person to mention this chair to me was Richard Reames, author of Arborsculpture, who practiced tree shaping for many years. Krubsack was born in Wisconsin’s Dodge County, but spent most of his life in Waupaca County, where he had a farm in Embarrass. (The town’s name comes from the French verb embarrasser, which can mean “to hinder or slow down”—apparently the river through town is not easy to navigate.) When John Krubsack lived in Embarrass, the population hovered below 300 people. It’s been close to 500, and is around 400 today. The town has a Main Street and a High Street, a couple of bars, a feed store, and a vintage store in a historic church building. The chair lived for decades in a plexiglass case in Noritage Furniture. When I called the Waupaca chamber of commerce, they said they’d never heard of the chair, in part because Embarrass is on the other end of the county. I should try the Clintonville chamber of commerce, they told me. Clintonville is an order of magnitude bigger than Embarrass, but still a small place. The woman who picked up the phone there, Jackie, knew exactly what I was asking after: She used to work for Noritage. But she had no idea what happened to the chair. All she knew was that the Krubsack brothers are still alive. While researching Embarrass, I found another potential clue. After Noritage closed in 2007, a nearby auction company advertised liquidation sales, with real estate, equipment, and furniture available. Had the tree chair gone to auction? I was about to call the auction company when Steve Krubsack emailed back—a couple weeks after I’d reached out. The chair, he assured me, was still in the family. After Noritage closed, “the Chair That Grew was retained,” he wrote. His brother, in Clintonville, still has it. He gave me a phone number, and I eagerly called Dennis Krubsack, sensing the end of my month-long quest. I imagined that the chair was kept in a corner of a spacious house, the subject of family lore and legend. I wondered what would happen to it in the long run, whether the family planned to keep it forever or had made any plans for its long-term preservation.But when I got Dennis Krubsack on the phone, I was disappointed: He didn’t want to talk about it. The chair, it seems, had brought him little but bother—unwanted attention from visitors ringing his doorbell or people, like me, calling him on the phone. I am glad to know the chair is not lost, but I can’t help but feel sad that its heir doesn’t want any attention paid to it. 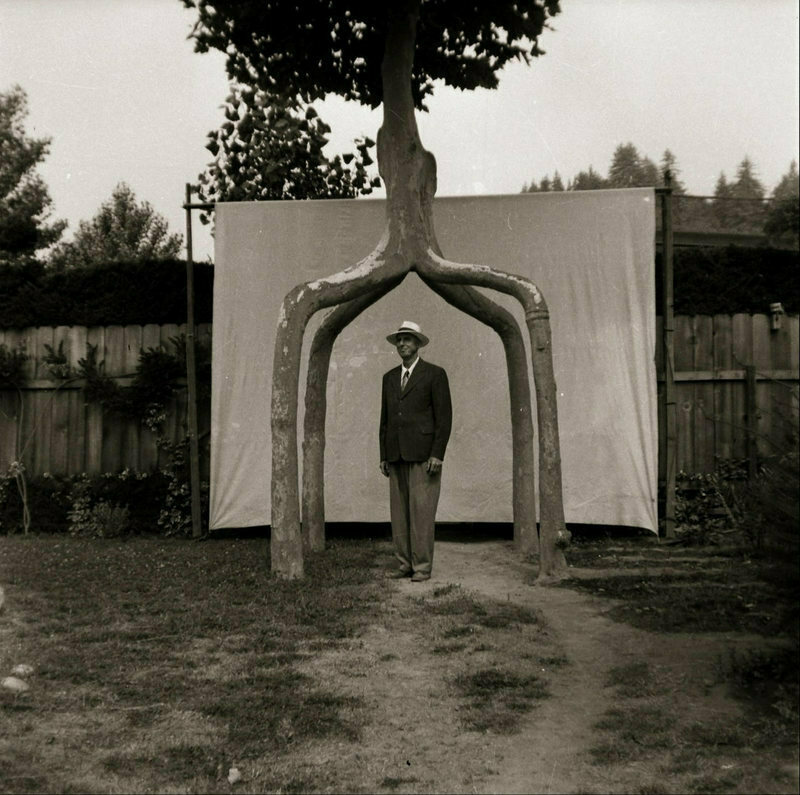 It reminds me of the fate of the incredible trees shaped by Axel Erlandson, a pioneer in the field. After he died, his “Tree Circus” was forgotten, and his trees, left unwatered, started to die. They’re around today only because Mark Primack, whose interest in botanical architecture led him to the surviving trees, saved them. Erlandson sold the land that held his trees to someone outside his family, which makes their situation different than the chair’s. Many families have heirlooms that pass from generation from generation, but most of those have little interest or value to outsiders. It just so happens that Dennis Krubsack’s is a chair that grew out of the ground. It’s rare that someone across an ocean—Munro, who is growing the orchard of furniture—would keep a picture of one of your family’s heirlooms on his desk. There’s an argument to be made that the chair should be in a museum, or a collection where it can be made accessible to the public. But it is a strange object, and there’s no guarantee that any museum would see its value, or that people passionate about tree shaping today can ensure its long-term preservation. The Krubsack family has kept the chair safe for more than a century. I hope they continue to keep it safe for decades to come. *This sentence has been updated to add the year the chair was harvested.